Tasel represents the name of the local soil. The grapes are made here in appassimento style, late harvest and dried 1-2 months. They are macerated with the skins and the wine matures for 1-2 years. 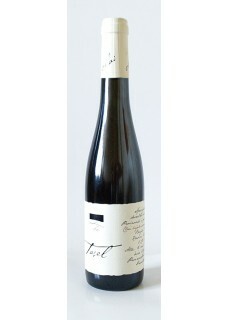 Tasel is made only in very good vintages. Huge aromas of orange rind, marmalade and honey bursts from the glass. On the palate aromas of apricot and caramel are interwind with herbal tones and white pepper. High level of sugar is balanced with surprisingly vibrant acidity. Persistent and pleasant sweet-bitter aftertaste remains after each sip. Definitely a peak in the category of best Croatian dessert wines. “Dessert wines are usually considered as a female drink, but often men are the ones which are coming back for my Tasel” says Clai. Food pairing: Excellent with Italian Gorgonzola or other aromatic cheese. Every Istrian winemaker will agree, Giorgio Clai is the most passionate winemaker on the peninsula, whose wines can be found in top restaurants of New York and San Francisco. “I’m making wine in the vineyard, not in the winery!” he will proudly tell you and continue with the story how it is important to know each vine in the vineyard because, depending on its position, you need to prune it differently. Today, the estate spans 7 h of vines and 3 h of olive trees spread out over 3 sites. Plavina, Moscato, Chardonnay, Pinot Grigio and Sauvignon Blanc are planted for whites, Merlot, Cabernet Sauvignon and Refosco for red. Two of the sites are walking distance from the Clai household; here, the heavy clay soils are surrounded by foothills and mountains, and produce the Ottocento bijeli (white) and Ottocento Crni (red). Vines are 10 to 16 years old, all planted/replanted by Giorgio himself. 4 km from Krasica, the vineyard Sveti Jakov is home to Giorgio's oldest vines and most unique terroir. Here, the site's proximity to the Adriatic heavily influences the vines, resulting in a much more mineral, saline style of wine. Both a Sveti Jakov bijeli and crni are produced. Giorgio follows the principles of biodynamic viticulture, so his wines are made from organic grapes without the addition of selected yeasts and with minimum amount of sulphur. Wines from white grape varieties are produced in a traditional manner, leaving the skins in contact with the must during the fermentation. In that way only indigenous yeasts are contributing to the aroma and flavour of a particular wine (so called “orange” or skin-contact wine), leaving a strong imprint of the terroir. All his wines have the beauty of a masterpiece that is hard to describe but very easy to drink, even if they are high in alcohol. You can taste Sv. Jakov made from pure Istrian Malvasia, white blend Ottocento bijelo and red blend Ottocento crno. If you are lucky enough, you will taste Brombonero directly from the barrell – a BIG red made from Refošk grapes only when the vintage is superb. Today, the estate spans 7 h of vines and 3 h of olive trees spread out over 3 sites. Plavina, Moscato, Chardonnay, Pinot Grigio and Sauvignon Blanc are planted for whites, Merlot, Cabernet Sauvignon and Refosco for red. Two of the sites are walking distance from the Clai household; here, the heavy clay soils are surrounded by foothills and mountains, and produce the Ottocento bijeli (white) and Ottocento Crni (red). Vines are 10 to 16 years old, all planted/replanted by Giorgio himself. 4 km from Krasica, the vineyard Sveti Jakov is home to Giorgio's oldest vines and most unique terroir. Here, the site's proximity to the Adriatic heavily influences the vines, resulting in a much more mineral, saline style of wine.